(CNN) – It's still a mystery why President Barack Obama was holding a baseball bat during his telephone conversation with Turkey's prime minister earlier this week. 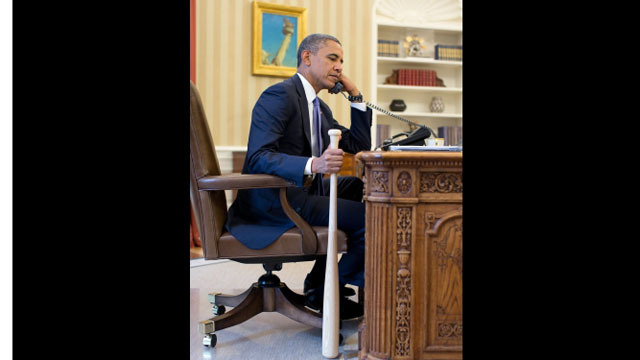 An official White House photo shows the president with the bat in one hand and a phone in the other. White House Press Secretary Jay Carney was asked about the photo on Tuesday and promised get some answers but so far nothing. Obama: I am ready for whatever comes out of that Mitt. they are not special prosecutors. they are doj lawyers that report to holder who reports to obama who was with the leakers. no conflict of interetst there huh? the american people will never know who compromised top secret information even though just about the whole world already knows who it was, just not officially. and then there was the dropping of the case against the black panthers for standing outside a polling place with a night stick after some of obama's political appointees pushed to get it dropped. the obama administration is corrupt as the night is long. A publicity shot, cause he sure doesn't know how to use it !!!! Whats the big deal? Clinton played with cigars..., maybe this is what it takes for Obama. I have no doubt Pres. Obama will get back with an answer. On the other hand, where is the promised information from Romney regarding his taxes during the ABC interview? Still waiting. and then there was the dropping of the case against the black panthers for standing outside a polling place with a night stick after some of obama's political appointees pushed to get it dropped. the obama administration is corrupt as the night is long." Sorry, my tinfoil hat doesn't receive the paranoia frequency. Let's talk later when your episode is over.